Sometimes I want a simple cake that doesn’t require a lot of my time or ingredients and this Lemon Ginger Sponge Cake with Raspberries is quick and easy to make. I decided to add lemon to the cake since our lemon trees blessed us with buckets of lemons so I have been grating and juicing lemons like crazy. Grate the lemons and juice them, place the juice in an ice cube tray to freeze. Store the grated lemon in zip lock bags and the juice in the freezer for later. Cut the lemons into slices, place on a tray and freeze, then put in plastic bags for use later. This is a great way to add lemons to drinks. Freeze the whole lemon and then grate it. Yes, you grate the whole lemon. Adds incredible flavor to cooked foods and baked good. I love grating/zesting citrus and use this Microplane grater all the time, it stays sharp and the length is perfect for zesting all types of citrus. If you happen to live near El Dorado Hills, CA, just stop by and get some lemons, there is usually a bucket of them sitting outside for giveaways. Hey, let’s talk about the cake since that’s what we are making. Sponge cakes are a bit unusual in that they are mostly made with three ingredients, eggs, sugar, and flour. The possibilities are endless for adding in your choice of flavorings. You can fill or top the cake with your favorite jams or maybe some lemon curd and fruit. For today’s cake, I added two of my favorite flavors lemon and ginger, but feel free to experiment with orange, cinnamon or maybe vanilla. Sponge cakes are a little like an angel food cake but are made with whole eggs and sugar that is whipped for several minutes to create volume because no baking powder is used. And for an added bonus there is no fat added to the cake, which is good for the waistline, right! Here is my tip for adding the flour to the batter. Measure the flour and then sift it into the egg and sugar batter a tablespoon at a time and gently fold into the batter; this way the egg mixture won’t deflate. If the batter deflates well …then the cake will be a pancake, and we aren’t making pancakes. While the cake is cooling make a lemon simple syrup to brush on the top of the cake which will add lots of yummy flavor and moisture. Finish this cake off with a billowing topping of sweetened whipped cream, berries, lemon zest and candied ginger. 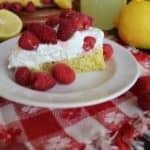 This is a simple Lemon Ginger Sponge Cake with a topping of creamy sweetened whipped cream and Raspberries. Preheat the oven to 350 degrees. Prepare an 8-inch pan by buttering the bottom and lining the bottom with a piece of parchment or wax paper. Butter the top of the paper. Using a whip attachment and beat the eggs in a large bowl for a minute. Stir in the vanilla, lemon zest and grated ginger. Sift 1 tablespoon of flour and salt on top of the batter and slowly fold in the flour. Add the 2nd tablespoon of flour to the batter and fold in until no flour appears. Do not over stir or you will deflate the batter. Pour the batter into the prepared pan and bake for 20 - 25 minutes. Let the cake cool for a minute then remove from the pan and remove the parchment paper then and place on a wire rack to completely cool. Mix the lemon juice and sugar in a small saucepan and bring to a boil to dissolve the sugar. Set aside and let cool. Whip the chilled whipped cream with the sugar. When the simple syrup is cool, brush the top of the cake. Dollop the whipped cream on top of cake and top with the raspberries, lemon zest and candied ginger. I think this is just the perfect cake to have with a nice cup of tea, a glass of Moscato or even a big glass of lemonade. Have some friends over or share with your family. This is the baking pan and I use. It’s nice and heavy with straight sides and bakes cakes evenly. Lemon and ginger are a classic combo, and with those raspberries on top, you’ve knocked it out of the park! YUM! I agree I love the flavor combination. I adore lemon flavoured anything!! This cake looks and sounds divine. Great idea to freeze lemons. Have to remember that! Thank you! This recipe looks amazing. The combo of lemon and ginger is awesome! I agree about the lemon and ginger, they go hand-in-hand. As soon as the weather gets warmer I always crave all things lemon. Love the raspberry combo too! I am trying this asap! I love the sound of this cake and the flavours are awesome. The cake looks so soft and spongy with great texture. love this twist on a strawberry shortcake using raspberries! Lemon and raspberry is always a great dessert flavour combo for summer! This looks so good! I have never made a sponge cake before, but it is definitely on my to-do list!! Yes, thank God for mug cakes. Lemon is just my favourite flavour!!! I was the kid who ate the lemon slices and not much has changed! This cake looks so fluffy and delicious!!!! Oh, you are so lucky, Napa is absolutely beautiful right now. Yum Yum Yum!!! I want to eat it for breakfast, lunch and dinner! Looks incredible! I can not wait to try this tastes. Thank you for sharing this great recipe! I have been known to eat cake for breakfast. I love good old sponge cake – it always reminds me of my childhood! Looks absolutely delicious! I love all types of lemon desserts and this one looks incredible! I love the addition of ginger for that warm, spicy flavour, and the fresh sweet raspberries on top is perfect. This cake looks absolutely scrumptious! And I never thought of freezing lemons. That’s a great idea. I often have leftovers of lemons that end up being spoiled in the fridge. Gotta freeze them next time.